A guide to the revision process for adults who write for children, for writing teachers at all levels, and for young readers who want to find out how authors rethink and revise their work. Both well-known and first-time authors reveal their process of making good ideas worthy of publication. Examples of published picture books, chapter books, YA novels, and magazine stories for all ages are included, along with early drafts of each work and an analysis of the various drafts. There are also interviews with each author about why they made the changes they did, and interviews with an agent and several editors about the kinds of revision they expect from professional writers. See how the Nine Essential Questions lead to polished, published stories! 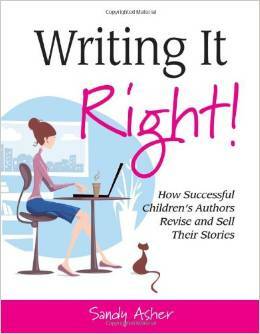 Though no longer available directly from Amazon.com (used copies only), this book is still very much in print and available from Writer’s Institute Publications at https://www.instituteforwriters.com/writing-it-right.html. Also, autographed copies are available directly from me at sandyasher@gmail.com.